You understand the importance of good oral hygiene and brush and floss diligently. But is it possible to be too diligent in your toothbrushing? Dentists say it is! Excessive tooth brushing, or overbrushing, can actually cause damage to your teeth and gums. What is overbrushing and what kind of damage can it cause? Is there something you can do about it? Our article will answer these important questions for you. Brushing regularly is vital for healthy teeth and gums, but dental experts warn that you can overdo a good thing. Known as “toothbrush abrasion,” overbrushing can lead to sensitive teeth and receding gums. When you brush too hard, you can wear down the outer layer of your teeth. Lost enamel means less protective coating for your teeth, which can cause your teeth to become sensitive to hot and cold. 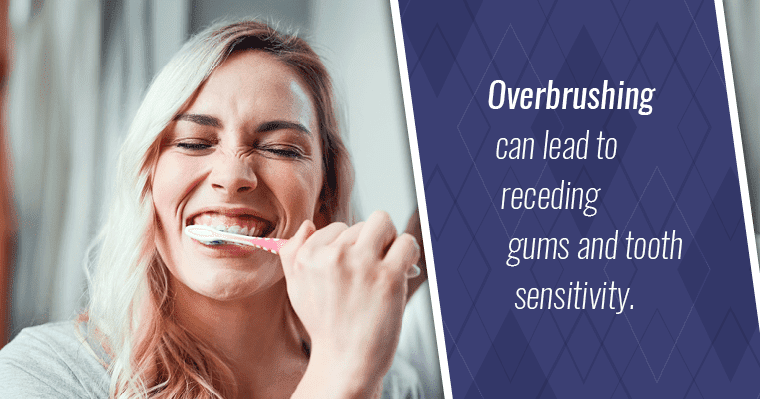 Brushing hard also damages tender gum tissue and can eventually cause it to recede, exposing sensitive tooth roots and leaving them vulnerable to periodontal disease and decay. Those most at risk for tooth or gum damage from overbrushing are those who brush too vigorously using medium- or hard-bristled toothbrushes. What are some signs to look for that may indicate you are overbrushing? So, how can you clean your teeth and gums effectively without damaging them? The aim of brushing your teeth is to remove plaque, the white sticky material which causes decay. To remove plaque, it’s good brushing technique that matters most, rather than brushing hard. Hold your brush at a 45-degree angle and aim at the gum line. Brush in a circular motion, not in a back and forth sawing motion. Apply just enough pressure to feel the bristles against the gums. Brush for two minutes – 30 seconds per quadrant. How often should you brush? Brushing two to three times a day is ideal. If you can brush once after every meal – breakfast, lunch, and dinner – you will help prevent the growth of bacteria. But, and this is very important, wait an hour after each meal: Brushing too soon can also cause damage to the enamel of your teeth. Tip: Toothbrush bristles break down with use and become frayed, which can damage tender gum tissue. Remember to replace your toothbrush or brush head every three months. An easy way to remember is to change your toothbrush with the change in seasons and buy brushes or brush heads in four-packs. Overbrushing is a wide-spread problem, but it can be corrected! If you’ve noticed that your gums have receded, or your teeth have become sensitive to hot or cold, contact your dentist right away. 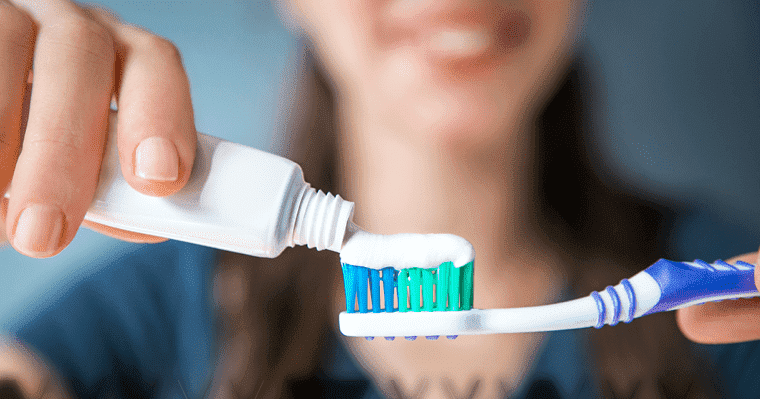 Otherwise, follow the tips we mentioned above and immediately make any needed adjustments to your brushing technique to enjoy a clean and healthy smile!